WATTever provides retail price data and analytics solutions for the retail electricity and gas markets. Our comprehensive database includes all publicly-listed retail electricity and gas plans for residential and small business customers in the contestable networks. 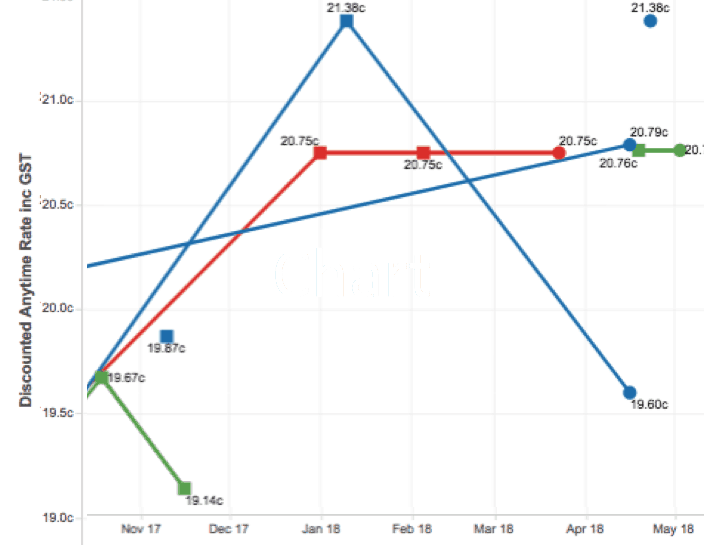 WATTever’s unique software empowers subscribers with a suite of visual dashboards clearly showing current energy pricing and competitors offers. The market moves fast. Stay on top. 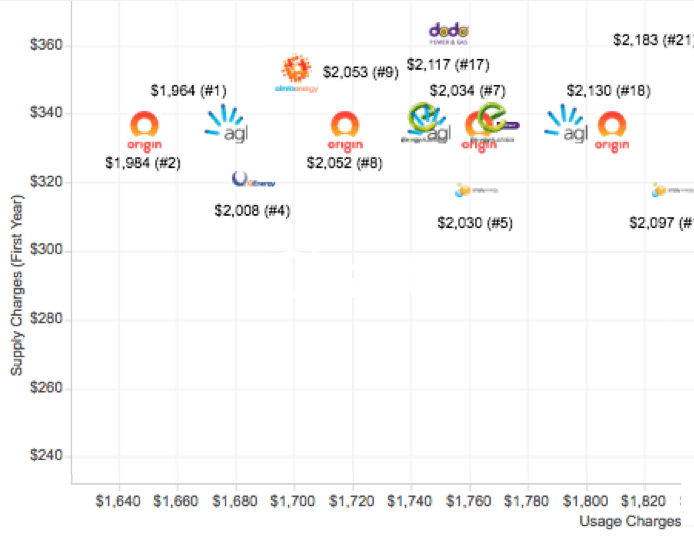 Know how electricity and gas plans compare to the market. Know what’s just changed (latest plans and price movements). 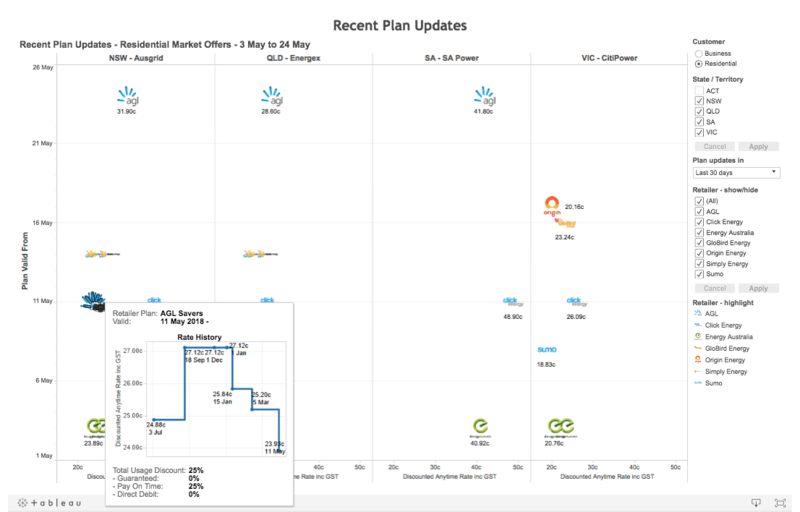 Create prospective electricity plans and compare these against current offers. Quality data is vital. But it’s insights that make the difference. Built on the world’s leading visual analytics platform, WATTever’s Energy Pricing Analytics solution delivers clear charts that let you ‘see’ and understand what’s going on. Designed to help find market insights and opportunities, the intuitive interface makes it easy for subscribers to select the combination of network, retailers, tariff and customer types and even individual plans, they want to target. 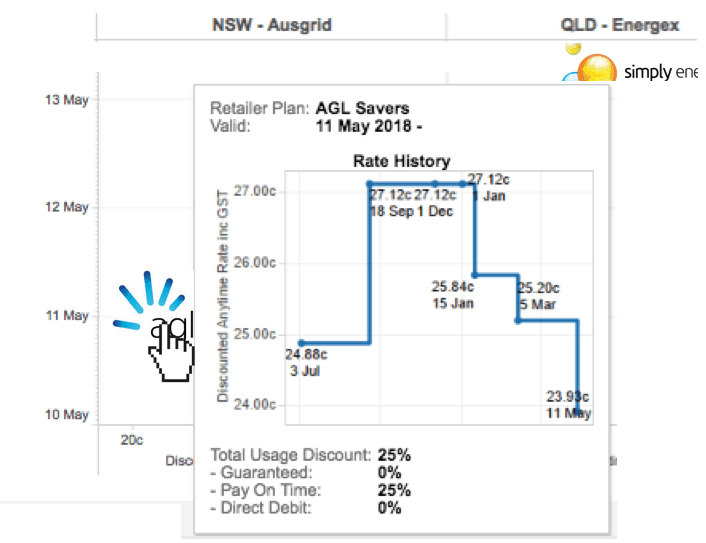 Then the Plan Development feature enables subscribers to create prospective electricity plans and test how they will compare to current offers. 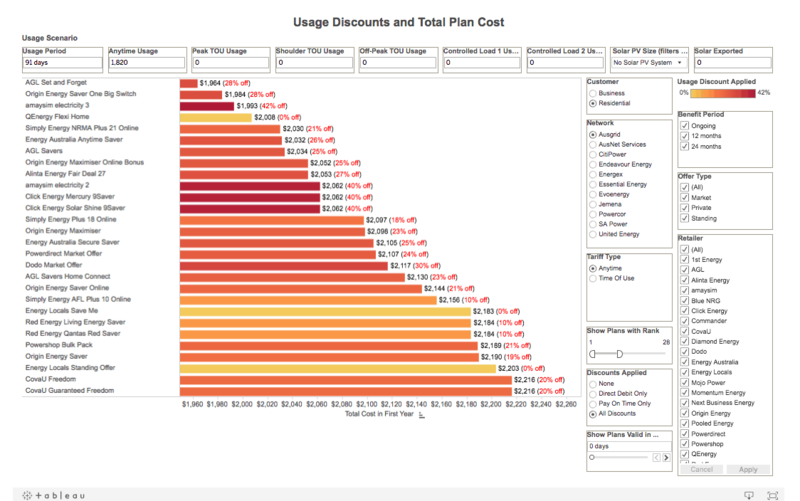 Gallery of key Pricing Analytics visualisations. Click to expand. Rate History shows current and historical pricing (from July 2017) for any retailers and plans selected. Trend lines make it easy to identify shifts. Recent plan updates are displayed on a timeline. 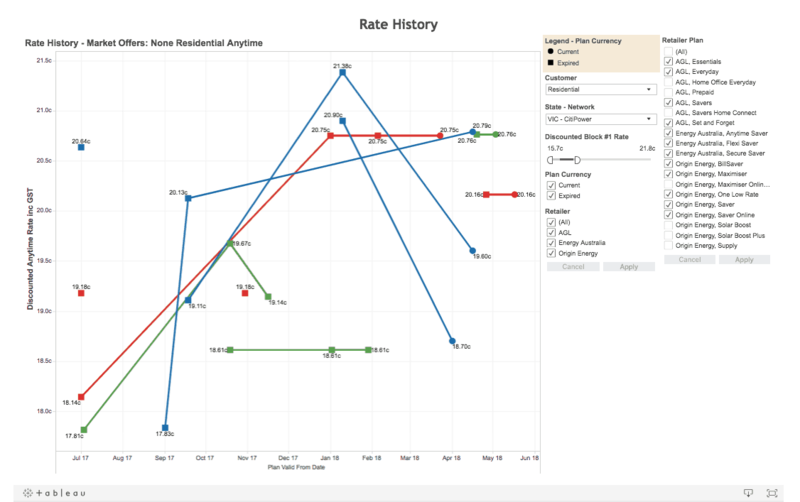 Rollover any plan icon to see a rate history pop up, with direct access to retailer fact sheets. 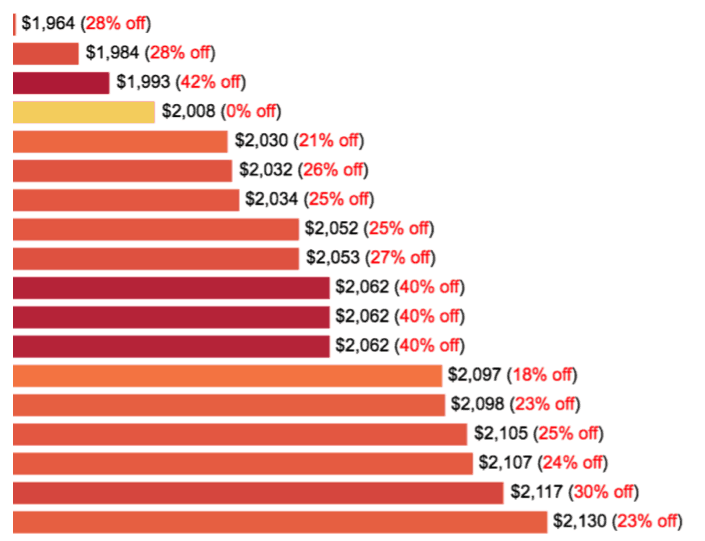 Plan discount and ranking helps unpack competitors pricing and discounting tactics, showing the impact on overall cost ranking. 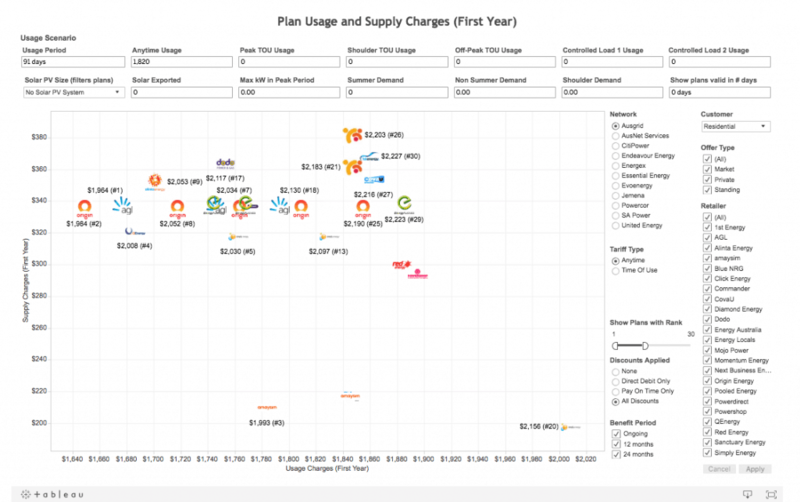 Plan Pricing Comparison Usage vs Supply shows the pricing tactics competitors use balancing usage and supply charges in their plans. WATTever provide analytics solutions and price comparison information for the retail energy market. Our comprehensive database includes all publicly-listed retail electricity and gas plans for residential and small business customers in the contestable networks.